Hudson Valley has received critical acclaim from around the world as the premier producers of Foie Gras and Moulard Duck products. Historically, foie gras is cooked in a paté or terrine and served cold. However, the last decade has seen the gain in U.S. popularity of serving foie gras seared hot with a sweet and tangy fruit garnish. Fresh full lobes are cryovac-sealed and shipped in styrofoam containers with frozen gel packs. Once we have processed your order, it will be shipped overnight. Frozen foie gras is available in tray packages of four 1.5 oz slices. This is a full bodied cheese with a nutty flavor and smooth texture. 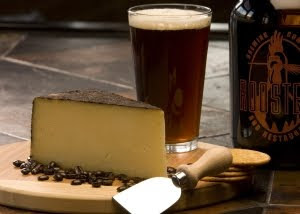 The cheese is hand rubbed with a Turkish grind of Colorado Legacy Coffee Company's (The Cheesemakers brother) "Beehive Blend". The blend consists of a mix of South American, Central American, and Indonesian beans roasted to different styles. French Superior Lavendar buds are ground with the coffee and the mixture is diluted with oil to suspend the dry ingredients in the rub. The rub imparts notes of butterscotch and caramel which are prevalent near the rind, but find their way to the enter of the cheese. The cheese is aged on Utah Blue Spruce aging racks in our humidity controlled caves, and moved to different temperature during the aging process to develop texture and flavor. The name "Barely Buzzed" comes from Andrea at Deluxe Foods in California. She was the winner of the name this cheese contest. Awards - 1st Place, Flavored Cheddar American Cheese Society Annual Competition 2007 and 2008.